We’d love your help. 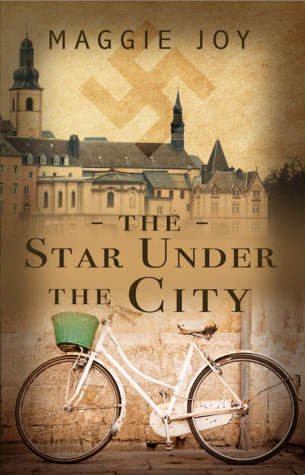 Let us know what’s wrong with this preview of The Star Under the City by Maggie Joy. When Ellen is suddenly orphaned and dropped alone into a strange city under tight Nazi control, she struggles to survive from day to day. Her life takes an unexpected turn when she finds a mysterious, metal six-point star that is slightly different from the ‘Star of David’ all Jews are forced to wear. Not only does the star feel like a sign of hope, but it sets her on a miss When Ellen is suddenly orphaned and dropped alone into a strange city under tight Nazi control, she struggles to survive from day to day. Not only does the star feel like a sign of hope, but it sets her on a mission to find out what it really means. As she begins to wonder if she'll ever find answers, she meets Lenz, and her life is flung into a whirlwind of danger and hardship, new friends and new enemies, and opportunities to learn trust and true sacrifice. To ask other readers questions about The Star Under the City, please sign up. Maggie Joy My knee-jerk reaction was to say no. But thinking harder I would say, a small amount. Though it is certainly not a "romance" book by definition, there…moreMy knee-jerk reaction was to say no. But thinking harder I would say, a small amount. Though it is certainly not a "romance" book by definition, there are deep friendships and an engagement in it. This book is A.W.E.S.O.M.E!!!! The genre is one of my favorites (Historical Fiction), the storyline is thrilling, and the way the author makes you get to know the charecters is amazing. The story is very exciting, (it kept me on the edge of my seat for most of the time) but it doesn't sacrifice depth of character for action and excitement. The entire time I felt as if I was experiencing the story rather then reading it. I also appreciated the way the story was honoring to God in every way throug This book is A.W.E.S.O.M.E!!!! The genre is one of my favorites (Historical Fiction), the storyline is thrilling, and the way the author makes you get to know the charecters is amazing. The story is very exciting, (it kept me on the edge of my seat for most of the time) but it doesn't sacrifice depth of character for action and excitement. The entire time I felt as if I was experiencing the story rather then reading it. I also appreciated the way the story was honoring to God in every way througout the story, and the biblical worldview was worked into the story, rather than thrown on just so it could be a "Christain" book. Aw, that was so precious! The storyline\plot wasn't super cohesive, and felt more like a col Aw, that was so precious! The storyline\plot wasn't super cohesive, and felt more like a collection of stories rather than an actual plot line, but I didn't mind it too much. It was still super sweet, and the themes and lessons Ellen learned throughout were all. Spot. On. So beautiful! I found myself near tears numerous times. This book was really really good!!!! I can't begin to tell how much I enjoyed it. I sympathized with the characters and felt everything they felt. The characters were so real, so relatable! The mystery left in it made the book even better. There were so many moments when I was like, "Wow!! This is so epic!!" I recommend this book to anyone, and I hope you'll buy it. To sum it up, this book is AMAZING and WONDERFUL!!!!!!!!!!!!!!!!!!!!!!!!!!!! !